Night had just set in as Karimul Haque, 52, returned from his work. A worker in a tea garden it had been a tiring day for him. However, sleep was a distant dream as one look at his mother’s face told him that something is grossly amiss. He wanted to take her to the nearest hospital but was unable to get any help. Finally, death won the battle and Karimul lost his mother. This incident changed Karimul’s life forever. Karimul took a vow that no other fellow human being should die because of lack of timely medical help. Today, the blue light is enough to alert the villagers of Dhalabari village in West Bengal’s Jalpaiguri district that ‘ Bike Ambulance Dada ‘ is ferrying some soul in need to the nearby hospital. The journey was however not easy. One day his friend and fellow worker Azizul fell down and became unconscious. Karimul could not let his friend suffer. He used a piece of cloth to tie his friend to his back and rode his bike for 50 km to the hospital in Jalpaiguri. Karimul’s effort paid off and Azizul’s life was saved. 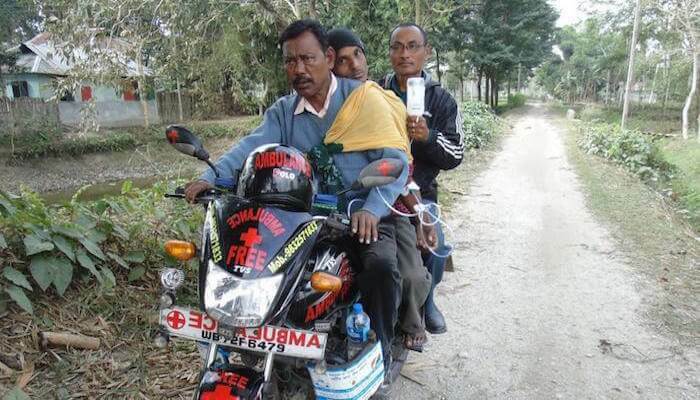 A simple man from a small village in Jalpaiguri, Karimul, tries to save lives of the people by taking them to the hospital on time without charging a single penny on his motorcycle. He has been doing this service to the people for the past fifteen years and has been successful in saving more than 3400 lives. Whatever the time, whatever the weather, “Ambulance Dada” has never said no. There has been times when he had to fight the adversaries of nature, crossed rivers, traveled through jungles to get to the nearest hospitals. This selfless man also keeps aside about one-fourth of his meager earnings to serve mankind. People in his village say that he is the one you would call at 2 a.m. The 68th Republic Day changed Karimul’s life forever when the list of Padma Awardees was uploaded a few days before. The most prestigious civilian award in the country celebrated the quiet and tireless efforts of Karimul Haque who has made a significant impact on the lives of many. He knows more than many how precious life is. A hero in real life, Karimul does not have magical powers. He is just one such individual who goes out of his way to help people. He doesn’t do this for recognition. Haque is motivated by his will to do the right thing selflessly. He is just an average man who focuses on doing good for his fellow human beings no matter what. There are times when he puts his own life at risk so that another person can live to see another day.